I LOVE getting comments on my blog. They are so uplifting an encouraging. It is so nice to know that I am prayed for and prayed with. So thank you for all of your encouraging words regarding potty training and all your prayers for precious Maggie! Pretty much daily Gwen answers comments that are in reality questions. I think its time I answered some of them publicly myself, so that Gwen doesn't have to keep explaining things like my "faith doctrine" to total strangers. "What is your faith doctrine?" I think this is a pretty strange question. I KNOW that it is not a question Jesus would have asked anyone before serving or loving or communicating with them. I am also saddened to think that my LOVE FOR JESUS may not be so apparent in my writing that it answers that question automatically. But here it is for those still asking: Jesus wrecked my life. All my life, I had everything this world says is important. In high school I was class president, homecoming queen, top of my class. I dated cute boys and drove a cute car. I had supportive parents who so desired my success that they would pay for me to go to college anywhere my heart desired. BUT, I loved Jesus. Jesus says to Nicodemus that in order to enter the Kingdom of Heaven, one must be born again. Check. Jesus says to another guy that in order to enter the kingdom of Heaven one must sell everything they have a give it to the poor and then COME, follow Him. Oh... I realized that I had loved and admired and worshipped Jesus without doing what He did. So I quit my life. Originally it was to be temporary, just a year before I went back to normal Brentwood life and college. It wasn't possible. I had seen what life was about and I couldn't pretend I didn't know. So I quit my life again, but for good this time. I quit college, I quit my cute designer and my little yellow convertible, I quit my boyfriend. I no longer have everything that the world says is important. BUT, I have everything that I know is important. I have never been happier, and I have never been closer to the Lover of my Soul and my Savior. JESUS wrecked my life, shattered it to put it back together more beautifully. I am in LOVE with Him. Period. "What made you decide to be a missionary? Do you like being a missionary?" I think that missionary is a funny word. I think that if you declare yourself a Christian, you MUST also be a missionary, your mission to live and to love like Christ, to share Christ with others. My walk with the Lord and my life should not seem so unusual that it has to have a special label. I'm just a mom. I just strive to live and to love people like Christ. The people just happen to be brown and poorer than you. It's not a special mission, It's everyone's mission. I do not deserve a title, and if you are going to give me one, I prefer "Lover of Jesus." And yes, I like it. "As a young single woman, don't you think living in Africa is dangerous? Are you afraid?" I am more afraid of America. Matthew 10:28 tells us not to fear things that can destroy the body but to fear things that can destroy the soul. I can literally feel my soul suffocating in the safety of Brentwood and all it's numbness, complacency and comfort. Scary. "I shall feel rather nervous meeting a lion," said Susan. "That you will, dearie, and make no mistake," said Mrs. Beaver, "if there is anyone who can appear before Aslan without their knees knocking they're either braver than most or just silly." "Safe?" said Mr. Beaver; "Who said anything about safe?! Of Course He isn't safe. But He is good. He is the King I tell you." No, I do not always stay safe. He's the King I tell you! We are not called to be safe, we are simply promised that when we are in danger God is right there with us, and there is no better place to be than in His hands. We are supposed to SHUDDER, knees knocking, when we think of our Lord and all He has called us to. So here I am, trembling. "Is it responsible to adopt so many children?" Is it responsible to let them starve in the streets? "What are you going to do next/with your home/with your children/with your ministry/in five years/when you are older/ect?" I am not concerned with what I am going to do. I am interested only in what I am becoming. Each day, I am hoping to become more like the One who created me. There is an old Franciscan saying, "Preach the Gospel. And when necessary, use words." So I am going to quit this silly preaching with words and go make dinner for my precious ones. Your questions are welcome. Thank you for sharing your heart!! You have an incredible gift & I get a little giddy when I see a new post from you:) We celebrate your beautiful work in Uganda....our adoption agency AWAA is coming your way in June. I don't think you'll be there personally, but they have the honor of meeting all your kids!! i do love when you share your heart ... Your desire for the FATHER, SAVIOR of our souls... We are all nothing, but a bunch of sinners in need of a loving FATHER and you are showing that FATHER to all the amazing people around you in Uganda !!! love ya sister !!! leaving the hospital today ...DOING MY HAPPY DANCE !!! YOU INSPIRE ME. Your words touch my heart. They are so full and brimming over with the Holy Spirit. I look forward to us hangin' out together in heaven one day. Great post!! Oh I miss you guys SOOOOOOOO much...my dad told me last night that he talked to the big girls on the phone...i'm SOOOO jealous...give everyone a big hug and kiss for me..I love you guys!!! Awesome post! I love what you said about the "comfort" of America - oh so scary! So easy to stay lukewarm! When I talk about Africa or anyone really, that may be poor, etc it seems a glaze comes over their eyes and an immediate disconnect happens, enforced by the constant bombardment of media telling America they deserve a nicer car, bigger vacation, newer house! I praise God for opening my eyes. Now I need to guard my heart to stay with Him in focus! I always marvel at the way James 1:27 is written - "Pure and genuine religion in the sight of God the Father means caring for orphans and widows in their distress and refusing to let the world corrupt you." I always think - God how did you know that I would need to see that the world would want to corrupt me when I cared for the widow and orphan - God is so smart - haha! Well said!!!! Continuing to pray with you and for you and your family Katie. Well said! I love your blog and your mission. Praise God! thank you for that post. I needed that reminder to 'quit this life' and live for Jesus. It also seems silly to me that you would receive so many of these questions over and over, but I think that people are reaching out, trying to understand, and perhaps they are encouraged and inspired by you, even if they are not saying so. I know that you have no doubts about where God has placed you and why. It is an incredible testimony... and all people reading about it are being touched and moved...even if they don't know it yet. Love and prayers over you and your village. I didn't ask any of those questions, but I appreciate hearing your answers! I am a partner in the WRECKED life department! Amen! and praise God for the journey! Love your ministry, children, heart and you! Sharing the Father's love! I just love your answers to these questions. My family and I whole-heartedly agree. We pray for you often, follow your story and have your link on our blog. Maybe someday we'll be able to come and support you in Uganda! Katie...I've been reading/praying for/loving you in your journey for a while now and this is the first time I've commented. As I read your answers I found myself smiling, laughing, shouting, crying and laughing again. May we all just become more like Jesus and just love...may we just learn to love. You encourage and challenge me. Thank you. Thank you. Here's my preface: I'm a first time blogger to your site, so I haven't asked you anything before! I didn't hear the heart of the "faith doctrine" questions being asked of you, but I do wonder if part of what you're hearing is a reaction to the pervasive syncretism in this wacky place called America. A lot of folks here do a lot of talking about Jesus and then at some point, you realize, "Wow! The more they talk, the more they aren't talking about the Jesus of the Bible." There are a ton of "spiritual" folks here who think Jesus is great, but not The Truth, The Life, The Way. As a mom, I want my girls to read your blog and blast out of their minds any American ideas of how they should spend their lives after high school. As a mom, I want to make sure I'm exposing them to someone who is a Lover of Jesus with a Biblical foundation. What I find funny sometimes, is we look at someone like you and think, what a shock that you would "leave everything" and go to Africa. When in reality, like you said, you're just being a Christian. Praying God will keep being glorified by you and praying that your iron keeps sharpening the iron of many folks all over. Sparks are gonna fly, but the result...a tool the Lord will use. AMEN SISTER! Completely agree with you! God is so great! I love that He has given you these words to share with His people. There is something I think many people try to avoid in this life because it can be very scary; it's obedience. You have been obedient to your Father. Duet 28:1-3 says, "If you fully obey the LORD your God and carefully follow all his commands I give you today, the LORD your God will set you high above all the nations on earth. All these blessings will come upon you and accompany you if you obey the LORD your God:". It goes on to list all the blessings the Lord will give you. I pray these blessings over you as you live out the life God has called you to. why are you so cool and lovable? why is your mom such a beaming ray? have you invited ellen d. to visit your ministry yet? We find it sometimes harder to minister to others here in America than if we were in another country because they are complacent and chasing the things of this world.... but I am seeing some winds of change! Thank you for this amazing post...I hope you don't mind if I post about it on my blog... my heart just wants to shout..."stop following the world and follow Jesus...your life will be more amazing than anything you could imagine". But I LONG to give my all, to hug babies, to nurture more than just my one little chick. i love reading your blog, by the way. What a gorgeous photo...I wish my home looked like that in Canada...God is so good. Thank you for the most amazing post...but I say that everytime I leave a comment. God has truly gifted you with words. "...Father God you have gifted this young woman with words to move the hearts of people...and may our hearts truly be moved. I thank you Lord that you have placed Katie in Uganda to be a mother to these precious children. Thank you Father for blessing her with a life that we all so desperately need. Give each of us eyes, ears and a heart like Katie..which is truly Your Father heart. Please provide everything that Katie and her ministry needs to care for Your children and Your people. Please heal Katie's body from this sickness she now has. Give her strength to soar on the wings of eagles. Bless you abundantly...protect her from the evil one. Surround her home with ALL your angels. May you be glorified in everything that she says and does for the least of these...in thy name we pray, AMEN"
My sentiments exactly. After returning from Uganda last year I left feeling the same way as you. The difficulty is that I have am married with four children and when I came back home I was different and everyone else was the same. It is unfair to expect everyone to have the same feelings we have if they haven't experienced it, but man do I struggle being home. Thank goodness my work continues........I'm going back......hoping to find a child to adopt and making a diffrence with our project. You are a girl after my own heart. Love those children for all of us who can't be their but want to be ! I can't believe this is the first time I'm writing to you. My husband and I have been following your ministry for some time now, and tell everyone we know about you! My name is Megan, and the mayernick's are some of my dearest friends. I nannied for thier kids while I was at Belmont. I started babysitting for them right after Milleranne was born if that gives you an idea! Love LOVE them. Suzanne helped me survive being a newlywed and trying to finish school. Many days the insanity of all those kids helped bring peace into my life, I'm sure you understand...If God can take care of the least of these...whoo! Well, shortly after Suzanne became your stalker (LOL) she told me your story, and needless to say I became a stalker as well. We shared your story with our families and this Christmas my husband and I decided that instead of spending money on gifts we didnt need, we would spend it on your precious ones. We asked our families to do the same. It was the least stressful Christmas I've had since I've been married. THANK YOU! Justin (my husband) and I both have adoption stories in our families, and sprinkle the Mayernicks on top of that....lets just say there was never any question that adoption would be in our future. Frankly, it can't get here soon enough but God's timing is perfect. I don't know what specific encouragement you need at this moment but I want you to know that we are rejoicing over every blessing God gives to you along the way! That we GET IT, and love you for GETTING IT too! I could not picture you doing anything else with your life, and we've never met! I hope that whenever you do visit the states again that we can meet. Or maybe Justin and I can hop on the next plane to Uganda! Katie, thank you for taking care of orphans. Thank you from the bottom of my heart. ps- I work at a preschool right now and just today alone we've had three massive poop explosions...so I feel ya girl with the potty training...who knew a person so small could make such a huge disaster??? Katie, I "just happened" upon your blog. (God ordained timing) and I have so blessed reading your faith into action. I have three young girls and we are in process of adopting two more from Ethiopia. It is my prayer that they will serve the Lord with all their heart and do wild and crazy thing for Jesus. Thank you for being a wonderful example that I am able to share with them! Do you have an address there? We would like to send a care package. 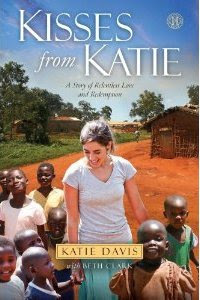 Katie- I started reading your blog on a regular basis after a friend told me what you're doing in Uganda. Go for it girl! I have been challenged and uplifted with every sentence I've read. I can truly feel your passion and love for the Lord and for these kids. The world will always challenge the "whys" especially those who are "older and wiser" but I am so encouraged by the fact that you did give up everything and are now doing this. praying for you and your sweet kids! i'm in love with them already as i'm sure you were from the very beginning. blessings and love to you! I cannot imagine that anyone who has really read your blog would not know your "faith doctrine". The love of Christ seeps out of your pores. And because of that, I am so encouraged by you. In my little white suburban life, I fight everyday to not be complacent, apathetic, or stale. Thank you for encouraging me. Thank you for believing the bible is literal. I may not be moving to Africa today, but I am daily trying to live less like an American and more like a follower of Jesus. Bless you Katie. I hope one day to meet you. If not this side of heaven, then I pray God introduces us on the other side. Also, I haven't done a blog auction since before Christmas, but am planning on doing another one soon. I want to have the money donated from the auction go straight to Amazima. I hope that in the process people will learn more about your ministry and be as encouraged as I am. Amen, AMEN!! girl! wow, you said it! so encouraged by your walk. Living out the gospel daily, true joy. Thank you for sharing! you are love, my sister! Jesus and I speak of you and your little ones frequently. Katie, you are a good kid (ok, young women :-) and a blessing to the Lord! My heart wells up within me to see that commitment to Jesus Christ. And how that love extends outward to the world. Thanks for sharing your heart and remember to wash your hands before you cook...hehe, just kidding. Once a mom, always a mom....:-) Praying for those precious ones of yours! I've never met you, but you have shared your heart and been so transparent on here that I feel know you. Let me tell you, who I think you are....a sold out follower of Jesus. That's it. You've given your life completely to Him and what I see is HIM pouring out of you. He loves you and you have allowed that love to consume your life. Bless you for it. So many others, including myself, are benefitting from it. I have been following your blog for a a few months now, and cannot express how much the Lord is using you and your life and your ministry in Uganda to teach and challenge and encourage me. Thank you for really and truly loving our Savior...for loving not just with words, but with action and in truth. I am learning much from you. Thank you. Praying for you, your sweet family of girls, and your ministry. May God's grace abound more and more to you each day! Jesus speaks to my heart through your words, Katie. Your love for Him and for others is evident in every photo and word you post. I'm, also, so thankful for God wrecking my life and putting me where I am (at a Christian camp). Thanks for the reminder that it's a different place for all of us. None is better than the other. We are all loving others in Jesus' name. I needed to be reminded of that today! Praying for you daily and all your beautiful children. Thanks for letting me sponsor one of children in your program. I pray for her daily as well! I have listed your site on my Facebook page in hopes that all of my friends and family will vist, learn, donate and love. I've just asked my 16 year old son to start reading your blog. I am so blessed by your heart and service. I pray to be that servant and yet do it with my eyes shut tight, teeth clenched and holding on with white nuckles to my comfortable life. Thank you for being an example and doing what we all should be doing. His love pours out from you and your children see Jesus every day. Katie, I am clapping my hands to you my friend. Your heart and ministry are clear. I love that you answer these questions, but like the quote said, YOU NEED NO WORDS. The Spirit of the Living God rests on you and your family, it is evident, I can feel it when I read and pray for you. I love your comment about adopting more children...Amen, we are on our way to 9! Love you sweet sister in Christ! OH...Can you tell us how your friend and daughter are doing? I was reading through your latest post "well since you asked..." I really enjoyed reading your answers to peoples quastions. There was one quastion that really shoked me and I have heard it before and I will never understand why people ask it. Is it responsible to adopt so many children? Is it responsible not to? God said that he was a Father to the fatherless and He has charged us to take care of these precious little ones. There is nothing that campares to holding a little child in your arms and being chosen to care for them and love them. Bringing an orphan into your home and getting to call them your daughter and your son is so special. We are all orphans in ths world and God wants to adopt all of us and bring us into His family. Every time we add another no longer orphaned child to our family and when I see them smile I feel such love and joy whelm up in my heart. Imagine the joy God must feel when one lost and orphaned sinner repents and becomes apart of Gods family! Any way,my mom and I love your heart and what you are doing. Good word sister! Love ya lots! I miss you all! Give your girls hugs and kisses for me!! And give Gladys an extra big hug and kiss for me the next time you see her! You go girl!!! that's all I can say. I'm not sure I can say any better words than thank you. I could have signed my name to your post. You just spoke my heart. Except that right now my heart is still longing almost breaking to live out what I know without a doubt that God has called our family to--serving him in Africa. Right now I am waiting on God and trying to combat Satan's attempts to stop us--and I am impatient. Please pray for our family as we journey to the heart of God. By the way, I found your blog a couple of months ago through Tracy and Elle Mihnovich. I love the way Jesus has wrecked your life! My name is Melanie and I've been following your blog for several months now after clicking on it on Gwen's sight. I'm drawn to your authentic faith and faithful obedience. I finished reading "Crazy Love" and girl, that's what it's all about!! I tell people about you all the time and I feel like I know you even though we haven't met. I think people in America are just desperate to see someone totally living a transformed life for God.That's why they are so shocked when someone moves to Africa and gives up everything. We are truely happiest when we are giving away. I'm convinced the giver ends up more fulfilled than the receiver. We all have different ministries. It is an awesome crazy life!! Your message is so in tandem with what my pastor (Allen Jackson from World Outreach in Murfreesboro) preaches on a weekly basis about us being Jesus, salt and light to others. That is our job as Christ followers. I am currently teaching first grade and being a mom and wife. I am ready for God to wreck my life too! You know you get to the point where everything is so planned and then, Boom! God shows up. I can see His hand for how I got my teaching position in the first place and just the place we are. However, I'm open to more--a lot more. My family (husband-Trevis, Kids-Spencer-10, Natalie-8) prays for you and any need of your children daily. I thank God for you. It is your "keeping it real" approach that people are attracted to. Every single time i read your blog, you make me want to be a better "Everything". For someone as young as yourself to be as sure as you are in your relationship with Christ is so inspiring to me. You have allowed God to love you through and through and it is evident through the work that you do in Africa and the love that you have for all of those children. I am sure that they are thankful for you as Im sure you are for them. I found your blog and have been amazed by you, your life, and your faith ever since. The first time I read your blog, I had tears in my eyes and chills down my arms. I could feel your faith and God's amazing power through your words. I am a nurse and graduate in December as a nurse practioner. My #1 reason for returning to graduate school was to gain additional knowledge and skills to implement in medical missions. I would love to know of any medical needs your ministry may be in need of. I know you don't know me, but I thank you for being obedient. Every time I read your posts God sends me to my knees with thankfulness for you and praise for His goodness and mercy. Every time He uses your words to smack me upside the head and get my priorities straight. It also makes me cry for my little ones in Ukraine that we are working to adopt and helps me long for them all the more. I pray that the God of all peace, understanding, and wildness blesses you richly and gives you all that you ask for and more! I "stumbled" upon your blog through a post of a friend of mine. Needless to say, I felt a burden to leave a little note for you. First off, great post today. I can identify with so much of what you said. I spent several years in Kenya teaching. 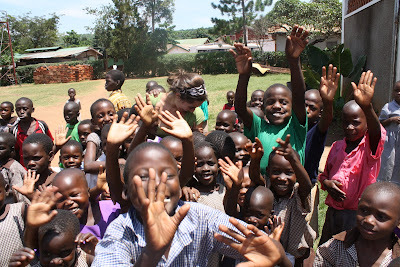 I always think in the back of my mind that someday I will end up in Africa running an orphanage or similar. One question you answered really resounded with me. It was the part about being a missionary. I always felt like people would try to elevate me to some higher status and I would have to tell them that I am just a regular person. I also became pretty "disappointed" with the lifestyle of Americans--huge houses, cars, etc. Anyways, I just wanted you to know that I am going to be here a while, praying for you, thinking of those sweet children, hoping that someday I will actually meet you. Maybe that will be in Uganda. I have lots of friends that work with SIL (Wycliffe) in East Africa. Hang in there, friend. Don't give up, and I will pray that God gives you supernatural energy, immunity from disease, and overflowing love and patience which will touch those little ones. I too have not commented on your blog which I have been reading for a couple months now... I LOVE this post... however the one that remains burned in my memory is the one about how you are in the midst of God's will for you and you know it... I LONG to hear what His will is for us, but I am afraid I am blocking it out for all the reasons you stated about being complacent. I pray all the time for Him to shout it to me, and it just fills my heart to know that we can hear Him when we are ready.... and that proof is you! Our prayers are with you and your children. We have two girls from China and I really feel my son is in Africa... Thank you sooo much for sharing your faith and your journey. What a testimony. God is using you in a big way. Great job, katie. I'm so proud of you. I loved when you said you aren't concerned by what you'll do in 5 years, but what you'll become. Good challenge for me and my planning self! Can't wait to see you. . share our hearts together for a week. . .and watch God work, baby!! Yes ma'am...to use a southern expression if I may! God said it, God ordained it, you're livin' it. You're oozing that joy. Praise the Lord! When I am living in Uganda (I say this by faith...and I think it will happen sooner than later), we'll have to do coffee :)!! I can't WAIT to meet you!!! Way to be, katie! Way to be! I can only pray to have a heart like yours! You are an inspiration to us all! I love ya girl!! Katie, this spoke to my heart in ways you cannot imagine!!! Thank you so much for sharing your heart, but not only that, thank you for living it. That Franciscan quote is my favorite! How true it is! And you talking about suffocating while you're in the states, I know what you mean completely. I get so frustrated with the complacency of American "christians". Thank you for being different---just like Christ calls us to be. Please let me know if I can help you in any way! My heart longs to help---to get out from among the numbness of "American Christianity" into a world who longs to hear about our Savior! Thank you so much for your testimony and declaration of Faith in that you just love Jesus. That is what concerns Christ...our love for Him and His people. Thank you for being a true disciple of Christ---how sad that that is so rare to find! God Bless you Katie!!! I came across your blog from Aimee Weathers who adopted Lily! I think I hit the jackpot from just the little bit I read. I can't even imagine questioning your faith or questioning your mission. God Bless you and I sure plan to visit again. I am so blessed to have adopted 6 children and each day I see God's work in my own life! I miss you already. The visitors are here and I wish you could come over. Joe is talking in his sleep and it's amusing. Betty is at the hospital with kymbi waiting for "treatment" even though nothing happened and he is fine. sorry about the echoli! is there anything I can get you from jinja town? I love you and can't wait to see you soon! FANTASTIC post! You really nail your love for Jesus down in a compelling and real way. Thank-you for sharing! I was just writing about that same quote from The Chronicles of Narnia about Aslan. GOOD not SAFE. I LOVE your blog. I'll be back. "What good is it, dear brothers and sisters, if you say you have faith but don't show it by your actions? Can that kind of faith save anyone? Suppose you see a brother or sister who has no food or clothing, and you say, "Good-bye and have a good day; stay warm and eat well"--but then you don't give that person any food or clothing. What good does that do? So you see, faith by itself isn't enough. Unless it produces good deeds, it is dead and useless. Now someone may argue, "Some people have faith; others have good deeds." But I say, "How can you show me your faith if you don't have good deeds? I will show you my faith by my good deeds." "
You are a true example of Christ's pure love. How hard would it be for all of us to truly get rid of our earlthy things and wants and do what the Lord wants. I struggle with that more and more. I am a working Mom and my heart know I should be home with my children, but how do we do it? How do we live on so little and keep up with our bills. Please pray for us, and I am always praying for you. God bless you sweet daughter of God! what is the secret diet your parents must have fed you when you were small. HA just kidding. I do love your blog it helps me remember that christ is the center of me and everything in my life. he is the one and only,through him all things are possible. and that my mission on earth is to raise my sweet five children in love of Christ and to follow him. thank you for your gentel reminder. Your post brought tears to my eyes. My heart resounds with the truth and beauty of your words and your heart. Your ministry and passion are very much what I have desired and sought after, and you are very much an inspiration to me. I pray that when I move to Southeastern Uganda, I will show the same humble love and servitude you exude in every post. Your love for the Father and His precious children is almost tangible! Please know that you touch lives you've never known through your faithfulness and devotion to the Lord. May He pour His abundant blessings out on you and your children! Ha! I love this. Well played. I loved reading this post, and it really struck a chord with me. After going to Uganda for two weeks, I am forever changed. I don't know how I was living in Christ before I realized what I was missing in my relationship with Him. I couldn't agree with you more that we are CALLED to take care of the poor--widows, orphans, and the sick--and to love them just as Jesus instructed us to love them. I consider myself so lucky that I have experienced true hope and happiness and love in the form of the trust that orphans have in Jesus Christ. "Quitting" your life to live for Him and honor Him with your work is such a worthy sacrifice, and I know you are inspiring many, including myself, to really examine how to live our lives for His glory. I am working on getting my church involved with Children's Hope Chest in Uganda, and can't wait to have another way to serve the Lord by serving His people in Uganda. What a blessing! I really enjoy reading your blog! I was wondering how exactly you got started in this particular ministry? I went back to the beginning of your blog,but I couldn't find how you decided exactly where to go,and how to get started. Also,are you the only caretaker of these children,or do you have helpers? Also,do the people in the town communicate and accept you? Sorry for so many questions,I am just so interested in what you do! You have a wonderful testimony. Thanks for taking the time to read this! Katie, I love reading your blog. It's so inspiring. You don't know me, but I have just moved to Tanzania 2 weeks ago with my husband and another couple. We are going to be in Uganda visiting a mission team there later this month and I would love to meet you and your beautiful children while we are up that way if it's possible. It may depend on where exactly you are located. I can't seem to find it on the map. Anyway, please email me if you think it might be possible. We are part of a team that will be starting an orphanage and also doing development work and would love to hear some of your stories. My email address is hollyvmcneal@gmail.com. Thanks. Have a great night. What a testimony. You live your faith. We (Steve, Cheryl and Grace) from williamsport IN, pray for you and your family continually. You encourage us to stop being caught up in this world and to keep serving in our community daily. Your grandmother, Joyce, is a joy to be in Bible study with! She is a beaming ray of sunshine, also! God bless you Katie!!!! Well done good and faithful servant! Well done for being Jesus to so many. Well done for giving up your comforts for true comfort and peace. Well done for loving those who are often considered unlovable, as He did. Well done for accepting that part of your "mission" is to answer questions. Well done MAMA, well done. I am the mama of 4, 2 from Africa and am praying for the Lord's guidance in where and what and how He wants to use me and my husband next...particularly in orphan ministry. I can't say much more than what has already been said. Thank you for sharing your heart and feelings with all of us. You are so strong and firm in your beliefs, and I admire you greatly for that. When we get to Heaven and all of the people's lives we touched are there to welcome us through the gates...Katie, what I imagine your "WELCOME HOME" to Heaven will be like is AMAZING. I think you would be very surprised at how many lives you really have CHANGED. Thank you, sweet sister in Christ!!!!! You are a wonderful example to everyone. Katie,your blogs are amazing. I always wonder how you do it! Praying especially for you, Maggie & Gwen. Do pray that you are feeling better & it wasn't what you thought it was. great truth as always. praying for you and your sweet children! you answered those questions beautifully. I'm a friend of Erin's by the way (MC and Jackson's mommy :). Katie,I have recently discovered your blog, and I can't wait to read it from start to finish. My friends and I spent a large part of last night discussing your journey and how God's work in you makes us want to "quit our lives" and start an orphanage. You are right--your story shouldn't seem at all shocking; it should be normal life for all believers. Thank you for sharing your story of how Jesus wrecked your life. I pray that He wrecks my life just as He has wrecked yours. Praying for you and your girls! Yes, Katie your writing clearly speaks your heart, your, "Faith doctrine." I am amazed by you and pray for you and your children always. I often ask God to "Use me like Katie". Through you my family has fallen in love with the children and people of Uganda. Keep doing as the Lord would have you. God bless you girl! Thanks for sharing your "heart of hearts". I love sharing your story with others young and old. It is a beautiful testimony to our Lord and Savior. Tell it, sister! Love and prayers being sent your way from Atlanta, GA.
P.S. I'll be in Uganda in late May to meet the little one God has already chosen to be a part of our family. Just in awe. Not of you, but Jesus working through you. I adore watching our Lord work. He is amazing. Oh, my goodness! You are prayed for and prayed with. And, yes your faith shouts loudly even without words. And, remember He will restore MANIFOLD more than you have left behind, both in this life and in the life to come. Well, I think you're already experiencing the blessings of following him in this life. Katie, Chris and I want to come and visit....I just watched the Mayernick's video!! I am overwhelmed, amazed, and challenged. I think I am suffocating here too. Lord, show us what we are to do next. I love reading what the Lord is teaching you. Thanks for sharing!! Thanks for loving Jesus like you do!! I love you! I LOVE YOU! I love love love you and the way you are loving the Lord! I love your blog and your heart!!! As always, I LOVED this post. I copied several of your questions and answers onto my blog yesterday (with links, of course). Your Statement of Faith was so totally right on! You may like to read another post I did yesterday about "Cookie Cutter Christians". Continue to let all that Jesus called us to do to be seen by all men so that our Father may be gloried. Your Love-Walk in Christ is so amazing as well as your obediance to Holy Spirits leadings!!! We are interceeding and praying for all your needs to be continually met as you rest your will into Heavenly Father's will and may the blood of Christ Jesus, our Lord and Savior, always protect you in this journey! I have no creeds but Christ I say. Rock on girl, go and serve His people. I love what you are doing, and you are right about it all....you are definitely blessed!!!!!!!!! We feel that way all the time too...we have 7 children all adopted, and people ask us all the time- How do you do it? I say how can we not do it- God called us to it! Your story is amazing!!!!! Your walk with Christ is an inspiration, because you are who God is calling you to be!!!!!!!! GOD BLESS ALL OF YOU!!! I am so touched by your blog and read it in its ENTIRETY this morning. I have some San Antonio friends coming to Uganda in about three weeks and now feel like I have a thousand prayers to pray for all of you! I would love for someone to email me privately. I would like to discuss coming there and seeing how I can help if you are open to it. I LOVE IT! Your straightforward answers are awesome! Every single one of them; thanks for sharing. And for putting people in their places by reminding them of the silliness of these questions & the mission we all have to do for Christ! The Lord has been speaking me and totally used this post to clarify a lot of things. He is asking me to quit my life and go somewhere. Please pray that my husband and I would be obedient to Jesus, leave everything and go. And for wisdom to know where he's calling us to. Thanks!